Reports warned that snakes may be "hiding in cupboards" or under carpets, among clothes or inside washing machines in homes previously submerged by floods that have devastated parts of Kerala. Worst-hit areas of Kerala have reported an increased cases of snake bites. Hospitals are readying anti-venom and flood victims returning home in Kerala have been told to stay alert as receding waters leave behind a glut of snakes. Reports warned that snakes may be "hiding in cupboards" or under carpets, among clothes or inside washing machines in homes previously submerged by floods that have devastated parts of the state. 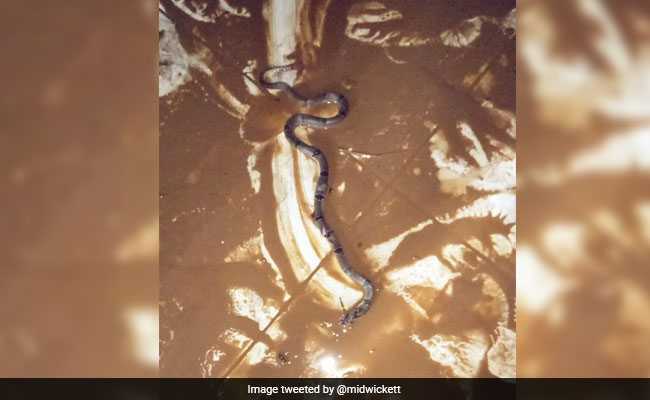 "Snakes are spotted at many flood-hit homes and alerts have been issued to exercise caution when returning home," state government spokesman Subhash TV told AFP on Friday. "Hospitals too have been equipped to face the situation. Instructions have been given to arrange facilities to treat snakebite victims. Anti-venom and other necessary medicines are stored at all hospitals, especially those in flood-hit areas," he added. Local media said several hospitals in the worst-hit areas of northern and central Kerala had reported an increase in the number of patients seeking treatment for snake bites. State authorities and wildlife experts have formed teams to come to the aid of those who have found snakes in their home, according to local media. The government had roped in a local snake expert, who advised returning residents to use a stick to sift through their belongings and not to touch household appliances with bare hands, according to news agency PTI. Around a million people are still packed into relief camps even though the floods, which have left over 200 dead and missing, are fast subsiding. Kerala has to rebuild itself after the worst floods in over a century. Hundreds have died and lakhs are homeless. Here is how you can help.